Here is their long-out-print debut LP from 1970, complete with original artwork. Includes, 'It Happened Today', 'Stretch', 'Blind Man' and 'Vivaldi with Cannons'. 10 tracks. Standard jewel case. 2000 release. 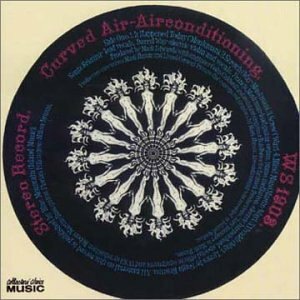 Released in 1970, Air Conditioning marks the emergence of Curved Air as a force within the realm of progressive music. Although it did not thrill me as much as Second Album (1971) or Phantasmagoria (1972), this is still a great Curved Air album and would make an excellent addition to the English psych/progressive rock collection. In spite of my griping however, it was the track It Happened Today that got me into Curved Air in the first place. The musicians on Air Conditioning include Sonja Kristina (lead vocals); Darryl Way (electric violin and vocals); Francis Monkman (electric guitar; Hammond organ; mellotron; electric harpsichord, special effects, VCS3 synthesizer, and piano); Robert Martin (electric bass; backing vocals); and Florian Pilkington-Miksa (drums and percussion). All of the band members are fantastic and Daryl even received formal musical training at the Royal College of Music. Both individual and ensemble virtuosity is high, which was characteristic of the English progressive rock bands in general. Although there is some superb keyboard work on the album, there is also a lot of hard-edged electric guitar work that seems to me to be more of a 1960's psychedelic holdover than anything else. With time however, the emphasis on the electric guitar would fade away and by the time of Phantasmagoria Francis would favor a more keyboard dominated approach. Sonja's lead vocals are superb and really contribute to the unique Curved Air sound, although they are not featured as prominently as on later albums by the group. Curved Air would have a revolving door when it came to bassists and Rob was the first of many - interestingly however, he did contribute a lot to the writing and has at least two co-writing credits with a third composition that he wrote alone (Rob One). The ten tracks range in length from 1:35 to Darryl's track Vivaldi (7:28). Musically, this is a heady mixture of psychedelic rock, progressive rock, classical, and experimental approaches along with some delicate acoustic moments (the soft track Blind Man is a good example). Perhaps the most 1960's sounding track on the album is the jam-heavy Propositions, which is dominated by heavy/spacey/psychedelic electric guitar work and excellent drumming. Darryl's instrumental piece Vivaldi features the violin as a solo instrument with a thunderous accompaniment by the entire band. My favorite tracks include the acoustic piano led track Situations (Francis does a great job on the piano), Screw, and Vivaldi, although the entire album works for me as a complete whole. This CD reissue by Collector's Choice Music is extremely skimpy and does not feature any liner notes or other extras. The sound quality is not that hot and the overall sound levels of the different tracks seem to vary. "It Happened Today" another person discovered this gem from 1970! As the author of the Jefferson Airplane book "Take Me To A Circus Tent" and a former radio disc-jockey, I am often asked to write and or discuss various music supplies and recordings from the 60's and 70's. "Air Conditioning" Curved Air's first record should be labeled a musical odyssey. The sheer brilliance of Francis Monkman's keyboards and guitar would be reason enough to procure the album. There are a myriad of mesmerizing events that further escalate the urgency in owning the recording. Sonja Kristina's vocals are captivating. Each word has a such a presence that the listener rids themselves of all internal distractions. Darryl Way's violin is played with the aggression of a guitar. It resonates in your mind long after the musical selection has ceased. While you often hear the band fall under the words progressive rock, they were influenced by avant-garde composer Terry Riley. Those that have followed the career of "It's A Beautiful Day" will enjoy the opening track "It Happened Today". Sonja vocals are captivating and leave a calling card for the songs that follow. "Stretch" isn't far from the early Jethro Tull realm. This particular tune may be the most underrated the band would pen. The longest composition on the album is the seven plus minute "Vivaldi" from Darryl Way. It can be described as an all out assault of the senses. Darryl's violin can be haunting or rocking but always hypnotic. Curved Air did not construct any long songs for the debut. What they achieved with the ten tracks were consistency, musical diversity, and a memorable record from 1970. Author of the Jefferson Airplane book "Take Me To A Circus Tent"
Released in 1970, this is Curved Air's first album. It is 44 minutes long. The original album came as picture disc (the picture on the cover was actually printed on the record). It was supposedly the first rock picture disc in history. It was also the first release by Warner Brothers of a British rock act. There are two versions of this CD. I have the Warner Brother's version and the sound quality is fair. It is flat and muted. I was debating to give this a 4 or a 5 star rating but settled on 4 stars because fo the sound quality. This version is from Collector's Choice Music. I don't know if the sound quality is any better. I remember not being impressed with other CCM releases. Curved Air was one of those groups that added "art rock" to "progressive rock", like Yes, the Nice and Emerson, Lake and Palmer. There were many progressive rock bands that did not have that art rock sound, like Caravan and Camel. This might be Curved Air's best stuido album. It has a number of very good songs on it. None of the go bombastically overboard (like Marie Antoinetted on a later album). Curved Air's sound and Sonja Kristina vocals could be harsh at times, but then the band could break into some wonderfully beautiful music. The first track, It Happened Today, is a prime example. It starts out with a hard driving, punchy vocal and ends up with a mellow violin solo. It sounds like Disneyland stole it for the theme music to the ride Soaring Over California. Curved Air was a volatile group of some amazing musicians. There was never a steady bassist. Francis Monkman (keyboards and guitar), Darryl Way (violin) and Florian Pilkington-Miska (drums) left after the third album and would could back every once in awhile. Sonja Kristina was Sonja Linwood for the first two albums. Mike Wedgewood would play bass on a couple of ablums before moving on to Caravan. Eddie Jobson would join later before going on to Roxy Music, UK, Jethro Tull and Frank Zappa. And this was Stewart Copeland's first band before forming the Police. 3stars,1/2,is righter:better things had to come afterwards! Better things had to come afterwards,nevertheless this debut album is not bad ... first of all the excellent female vocal by Sonia Kristina is a true Curved Air trademark and, despite of the bad arrangement of a famous track by Vivaldi, the opening track "It happened Today" already shows the several sides of Curved Air's music!! A mixture of experimental folk music, with the support of a tasteful violin and such an emotional playing !! The best track of the album is the instrumental "Rob one", a true Darryl Way's imprinting, with a great feeling,under the same characteristics as the best stuff within this debut album...including the already mentioned opener.